Marketing to Women #16 – Women Like Expensive Things? She paid $40 for that $5 bottle of wine. Sucker. I love psychological priming studies. For those who aren’t familiar, priming is the act of exposing someone to a stimulus (say, a picture of a smiling face or crying baby) and then seeing how someone reacts to another stimulus (say, how they feel about a certain product). My favorite example of this phenomenon was mentioned in Martin Lindstrom’s book Buyology, where he showed that playing French music in a liquor store increased sales of French wine by about 60% (usually without the person realizing the music was playing). To pile on, the store changed the music to German and had a similar sales increase of German wines, while the French wines began selling at their previous rates. Background music significantly changed buying behavior with only a handful of customers realizing it. 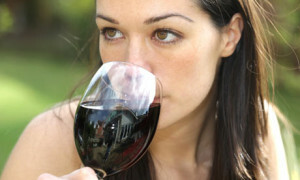 I mention priming because I came across a study conducted by the American Association of Wine Economists (thanks to Eric Barker for posting at Barking Up The Wrong Tree — I highly recommend his blog) that showed that disclosing the high price of a wine before tasting the wine produces considerably higher ratings, although only from women. Perhaps counter-intuitively, disclosing a lower price does not result in lower ratings. Leaning on stereotypes, women like expensive things and get greater enjoyment out of things that cost a lot of money regardless of the quality of those things. This would be referred to as “princess syndrome” among bitter single men or men in committed relationships writing marketing blogs who tend to carry the “man flag” in the gender wars (ahem). Women might be uncomfortable (consciously or unconsciously) with their ability to judge something that they feel is beyond their area of expertise. Having pricing information before tasting it might be the way women substitute others’ judgment for their own. Remember, the study didn’t ask “what wine do you like more?”, but rather, “how would you rate this wine?” The lower-priced wine, therefore, was assessed more in line with their experience because they weren’t intimidated by a $5 bottle (subjects in the study spent, on average, $13 for a bottle of wine, with 40% of them spending $10 or less). Do you see where those reasons for rating wine a certain way could drastically change the way you pursue a pricing and marketing strategy? If you’re in the “princess syndrome” camp, you’ll position your brand of wine to reflect high status, selling the bottle for considerably more than average in the hopes that you’ll capture a high-margin market. If you’re in the “judgment substitution” camp, you might sell your wine at an average price and position it to reflect quality and comfort, reinforcing that she simply can’t make a bad decision by buying your wine. Since the study didn’t address what wine women actually buy, a marketing manager could be pursuing the wrong strategy based upon their interpretation of the results of the study. Regardless of what you perceive to be the reason for the study results, it’s undeniable that people can be led to perceive the world a certain way by exposing them to information/stimuli before making a decision. Marketers need to realize that they have to reach customers in much more specific, targeted ways in order to influence behavior. This often means getting a better understanding of why humans make decisions and admitting that most of the decisions we make are based upon subconscious influences. In the end, consumers are far more likely to make emotional decisions and marketers need to get better at figuring out how to appeal to the very real and complicated feelings our customers bring to the buying experience. It’s the weekend … go out and have a drink. Just remember to drink the average wine — you probably can’t tell the difference and will save a couple of bucks in the process.